Choose the correct words for the blanks ! John Glenn was one of NASA’s first astronauts and the first American to the Earth. He belonged to the “Mercury 7”, a group of astronauts that would be sent into orbit at the beginning of the Space Race. Glenn was born in Ohio in 1921. In his early life he was a pilot in the Marine Corps during World War II and the Korean War. After the war he attended classes at the University of Maryland where he got a in chemistry. Towards the end of the 1950s it had become that America was in fierce with the Soviet Union to send a man into space and bring him safely back to Earth. 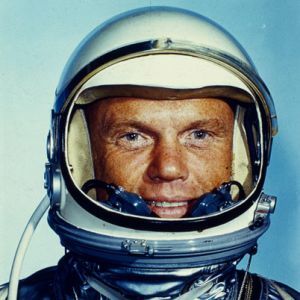 NASA chose 7 test pilots who would become astronauts in the Mercury program and John Glenn was one of them. Alan Shepard became the first American to reach space, John Glenn was the first to actually orbit the Earth. His flight aboard “Friendship 7” lasted 5 hours, in which Glenn orbited the Earth 3 times. During the problems came up and Glenn had to fly the spacecraft . It finally splashed down into the Atlantic Ocean. Glenn had become a hero and gave America to beat the Soviets in space. Because he was too old to be an astronaut for the moon landing at the end of the decade, John Glenn left NASA in 1964 and politics. After failing to become senator in his home state of Ohio he started a career in the business world, but still NASA in many fields. In 1974 Glenn finally became Democratic Senator in Ohio , where he remained until 1999. In his political career Glenn fought against the of nuclear weapons. He also tried to help the car and steel industry which were in a crisis in the 1980s. As a Democrat Glenn strongly criticized Republican president Ronald Reagan for his hardliner towards the Soviet Union in the Cold War. In 1998, 36 years after his historic flight, John Glenn to space on board the space shuttle Discovery. At the age of 77 he was the oldest person to ever take part in a space mission. He carried out that dealt with the physical problems of old age while in space.